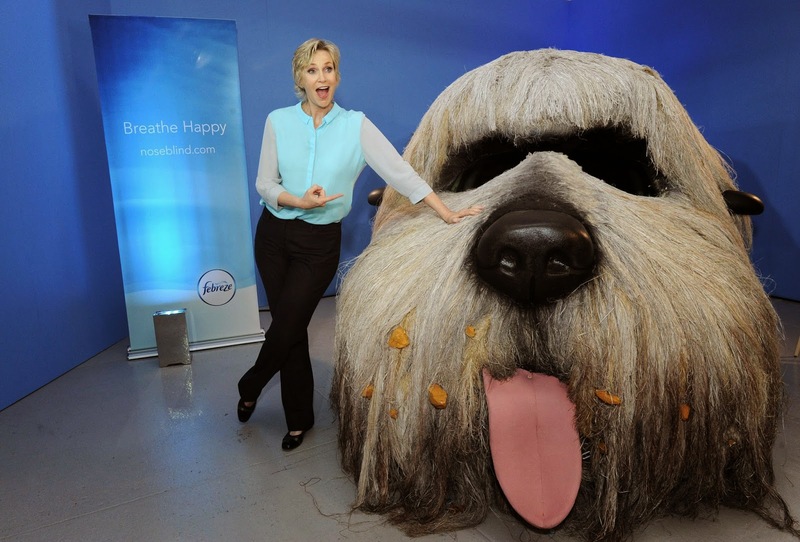 Jane Lynch on behalf of Febreze! The gradual acclimation to the smells of ones home, car, or belongings in which the affected does not notice (although guests do!). Example: "We can't go to that place anymore because it smells like fish". Acting as a viel of ignorance, this nasal condition affects unknowing Canadians, leaving them blind to the fact that their house smells like dogs, cats or sweaty gym gear. Everyday, millions of people suffer from noseblindness including their guests who most of the time wouldn't tell them in fear of hurt feelings. As a mom and owner of multiple dogs, I know smells happen. Everyday smells from an every day family. We are probably noseblind ourselves and don't even notice what others might. According to a recent survey by Febreze, 42% of Canadians admited they have been told their houses smell but hadn't been able to smell it themselves. If you own pets, have kids or have a work out routine, you could be noseblind too! - 93% of Canadians would like to know if their homes smelled bad. Wouldn't you? - Only 63% of us would tell our friends/family if their homes smelled. - 48% of Canadians feel a smelly home is the result of a dirty/lazy homeowner. Ouch. - For 61% of Canadians, a smelly home is a deal breaker when it comes to a date. 28% would make a quick exit if their date's home smelled. - 37% of us panic when guests arrive unexpectedly. I am one of this percent. - 45% of us dread visiting a home with pets because of the smell. That explains a lot! - 58% of us have wanted to get out of someones car because of the smell. Roll down those windows! Check out this Jane Lynch Noseblind PSA from Funny or Die if you don't believe all this! She explains it all plus gives some great tips on how to beat being Noseblind! Do you seek noseblind treatment? Don't waste your time (or favourite fragrance) any longer trying to mask the smells that may lurk in your home. Eliminate bad smells forever with Febreze. Febreze has four special odour killers that devour and defuse, neutrilize, surround and capture and trap perfume odours (aka chemical compounds) in the air. Destale the air with Febreze Air Effects. Refresh small spaces with Febreze Set & Refresh. Make it sniffable with Febreze Fabric Refresher. Rev up the freshness with Febreze Car Vent Clips. Unplug the noses with Febreze NOTICEables Duel Scented Oil Warmers. Sniff it real good with Febreze Stick & Refresh. With Febreze on hand, you are guaranteed to be cured of noseblindness! As "Lane Jynch" said, visit www.noseblind.ca for more information! Must be Canadian 18+ (excluding Quebec) with a valid email address to enter. Please fill out the entry ballot below, one mandatory entry per household. By entering this giveaway you understand your info may be shared with representatives of P&G for prizing purposes only. Good luck! Posted in participation with the P&GMom Ambassador program. Products and perks are received in affilliation. Opinions and comments are always honest and my own. My kitten peed on the laundry in the basement. I had no clue for 3 days. i have had a few nose blind moments, but i think we all have. I stepped in some gasoline on the ground while I was filling up my car one time. I went into a store and noticed the smell of gas never thinking it was coming from the bottoms of my shoes! I've realized after leaving my house for the day that a cat had peed on my clothes...ugh. I found moldy bread in the van. Somebody forgot to bring it in. It smelled really bad. Moldy lunch box in my work bag that did not get washed for a week. I went on a trip, came back and opened it. It smelled so horrible! My worst noseblind moment was when we had a musty smell in our home.We had some loose duct work under the air vent in the living room and, even though it's been repaired the musty odor still lingered. I noticed that when I have left my home for several days and returned and opened the door I could really smell it then! So gross, but my male cat was spraying around the house, especially in my closet when he was mad he couldn't go out. I was in a hurry to go to mediation one morning, and didn't notice anything on my way there, but once I was in my appt, I kept whispering to my lawyer that the room smelled like cat pee. After I left and was on my way home and could STILL smell cat pee, I sniffed my shirt and it was me - I was wearing a shirt my cat had sprayed all over, and after my nerves had settled and I walked out of mediation relieved, I noticed the stench was following me around! My nose blind moment involves one of my favourite fruit, guava. I think it has an amazing smell, but my husband doesn't like it and whenever he smells it he'll ask what that is and I wouldn't know what he's talking about. I have a cat and litter box,so I`m sure some people can probably smell it sometimes,,even though I can`t! I cooked up a large serving of cabbage for lazy cabbage rolls - that smell sticks! My neighbours have cats and the smell can be overwhelming when I'm over there. I always want to say something but just can't! 2 large dogs, three cats, two chinchillas, a gassy husband and stinky feet daughter.. (and today one of the dogs has really bad gas!) - so I am always noseblind..or trying to be! My worst moment was when I went to see my Aunt's house for the first time, but it totally smelled like a cat litter box. She didn't seem to notice how much her cats had taken over! I just brought home 2 bags of fresh fish and the blood leaked out. I thought I cleaned it properly but my wife smelled it the next day. The dog smell! I never smell it. Only the wet dog smell and after I leave the house for a bit and come back! Going to my husbands grandmothers and it smelled like moth balls. My bathroom with the Diaper Genie in it can sometimes smell awful if it's in need of emptying. 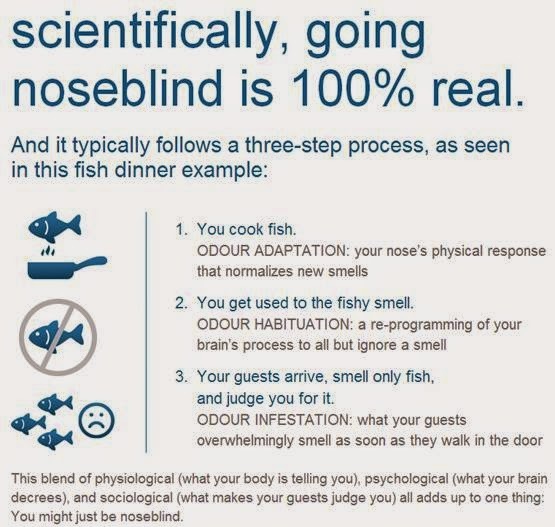 I am nose blind t the cooking smell from fish, onions and garlic in my house. Friends car and he smokes in his car!